Use this cake decorating tutorial and free template to make fondant baby shoes cake topper. Easy cake for baby shower, gender reveal parties and birthdays. I made this adorable baby cake with an edible fondant baby shoes cake topper, to CELEBRATE the royal baby’s arrival. I honestly DIDN’T expect myself to get WRAPPED up into this whole royal birth but somehow, I did…hehehe. This cake would be great for baby showers or even baby’s first birthday. I also think this would be a wonderful gender reveal cake too. Make pink fondant baby shoes for girls and blue fondant baby converse shoes for boys. This baby cake is actually a moist red velvet cake that is covered entirely in yellow marshmallow fondant and decorated with green polka dots and topped off with sweet little fondant baby shoe toppers. Don’t those fondant baby shoes just melt your heart with CUTENESS? Instead of buying expensive fondant baby shoes cutter, I suggest you use my FREE template for fondant baby shoes below… Save that money for something else. How to make fondant baby shoes template? Draw a template on thick paper with marker and use that to cut out all the individual fondant pieces. This is my fondant baby shoes template. Feel free to resize it and print it and use it for this tutorial. You can alter the design a bit and make a fondant baby bootie template too. How to make fondant baby shoes for cupcakes? You can resize this template to a smaller size and use that to cut out individual pieces and stick them together for smaller shoes. You don’t have to add too many details on these smaller shoes. Follow along my detailed instructions below. I prefer using 50/50 to make these shoes because it does not dry as fast as gum paste. Sometimes, I even make 70/30 (70% gum paste and 30% fondant). This allows me to go back and fix something. If I use gum paste only, the pieces start drying quickly, which means I have to work quickly and and it’s really difficult to fix mistakes. I don’t like using only fondant because it takes very long for the shoes to dry. Also, fondant is softer than gum paste, which makes assembling the shoe very difficult because the pieces don’t hold their shape well. Make this entire shoe on a sheet of wax paper because it prevents the pieces from sticking to your work surface. 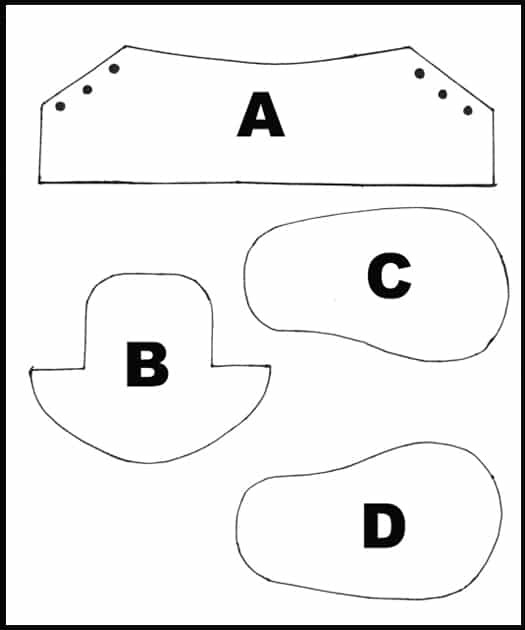 Print the shoe template on thick scrapbook paper. You can resize the image in Photoshop and make it bigger or smaller depending on how big or small you want the shoe to be. Roll out dark green 50/50 and cut out all the relevant shapes with a knife or pastry cutter. Use the quilting tool to create stitch marks on Piece A. Use Tip#3 to cut out three little circles around either side of Piece A. Keep aside. Stick Piece B on top of the corn syrup. Fill the hollow space with crumpled tissue so that this piece holds its shape. Brush corn syrup around the remaining edge of Piece C.
Stick Piece A on top of the corn syrup. Brush some more corn syrup along the sides of Piece A so that it sticks to Piece B. Use your fingers to smooth out the joint where Piece A is glued to Piece B. All this pressing and sticking of pieces makes the base of this shoe spread a little. To fix this, cut out any excess fondant near the back of the shoe. Fill the hollow space inside the shoe with tissue paper or a small plastic glasses. Roll out light green gum paste and use a large circle cutter to cut out a piece. Then, use a knife to cut it in half. Brush corn syrup on the front of the shoe and place this light green piece until it sticks into place. Smooth it out with your fingers and cut excess fondant. Use the quilting tool to create stitch marks of top of the light green piece. Now, cut out a long strip of light green fondant and press a toothpick all over the strip until you have vertical indentations. Brush corn syrup around the base of your shoe and stick the green strip. Cut excess strip and smooth the joint with your fingers. Most sneakers have a small loop near the back. To make this, cut a light green strip of gum paste and bend it into the shape of a loop and stick it at the back of the shoe with corn syrup. To make laces, use a clay extruder with a rectangular plate and push out strips of light green gum paste. Brush corn syrup in the holes. Then use a toothpick to push the laces into the holes. They don’t have to go all the way in but it should still look like the lace is inside the hole. To make the hanging laces, brush corn syrup in the holes and use your clay extruder to make 2 long strips and push each strip into the final hole and then let them just hang. Your fondant shoe is ready. Allow it to dry for 48 hours. Repeat these steps for the other shoe. This is so beautiful and creative. You’re an artist! This looks adorable, great job.